The Journey to Adulthood (J2A) program is a complete youth ministry program designed for spiritual formation for grades 6-12. This program encourages relational ministry. Components of the program include Bible study, prayer, rites of passage and outreach ministries. The two guiding principles of the program are: manhood and womanhood are free gifts from God, and Adulthood must be earned. The Journey to Adulthood program is split into two sections, Rite 13 and J2A. Rite 13 celebrates the individuality of each teen and their potential. A special liturgy is conducted for those turning 13 and serves as a rite of passage towards adulthood, with a community setting. J2A focuses on teen development of the creation and understanding of the importance of the Christian community. The group at St. Mary's has been involved with community service activities and providing programs for the church. The Youth Group will be resuming this fall with a varied lesson plan from the Rite 13/ J2A curriculum. The group will continue to meet on Sundays at 11:30 a.m. after the 10 a.m. service. Some topics and lessons to be covered include prayer, poverty, leadership, nonviolence and social service. Rite 13 signifies the start of each youth’s journey to adulthood. The curriculum focuses on each individual’s gifts and a set of skills to achieve within the lessons. Community activities and events in the church also occur each month. The youth will be taking an active role in the new family service (see page 6). 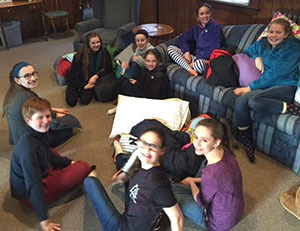 St. Mary’s Youth are also involved in YouthFusion, a group comprising Lutheran churches in the Manchester- Glastonbury area, which holds several events throughout the year. We look forward to having your child grow in this process.